Mumbai, Feb 14 (IANS) NorthEast United FC took a big step towards clinching a play-off spot after a crucial 2-0 win over Mumbai City FC in an Indian Super League (ISL) clash at the Mumbai Football Arena here on Wednesday. 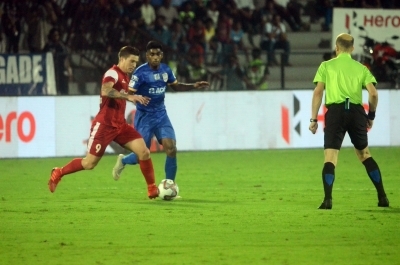 Two first-half goals from Rowllin Borges (4') and star striker Bartholomew Ogbeche (33') were enough for the visitors as Mumbai were consigned to their third defeat in a row. Both teams, with 27 points from 16 matches, are still very much in the play-off race. However, the result invites pressure on Mumbai as NorthEast climbed above them to the second spot and FC Goa can potentially leapfrog them too if they win against ATK on Thursday. Mumbai got off to a nightmarish start when NorthEast roared into the lead in the fourth minute. The goal stemmed from a brilliant run from Keegan Pereira down the left wing. His pinpoint low cross into the box was met by Borges who placed it into the top corner to stun the hosts. The Islanders did respond to that setback through Arnold Issoko who picked out Rafael Bastos on the edge of the box after ghosting past Mato Grgic to the byline. However, Bastos' curled effort clipped the crossbar and went out. The visitors troubled Mumbai from the left wing again. Borges forced a save from Mumbai goalkeeper Amrinder Singh with a header from Panagiotis Triadis' cross from the left. The home team lacked a bit of flair in the attacking third and NorthEast pressed home their advantage just past the half an hour mark. Federico Gallego did well to release Reagan Singh down the right wing. His cross was bundled in at the far post by Ogbeche to notch his 12th goal of the season and pull clear of Ferran Corominas in the race for the Golden Boot. Mumbai defence looked all at sea as NorthEast threatened again through Triadis and almost made it 3-0 before half-time. The home team, however, started the second-half aggressively in search of a goal that could bring them back into the contest. But the NorthEast defence was not troubled much. Paulo Machado did almost release Marko Klisura in behind the defence but his touch let him down. Eelco Schattorie's side slowed down the game as the half wore on and started to frustrate the home team. The Islanders' forays forward were limited to half-chances and on occasions when they got a sight on goal, their finishing let them down. NorthEast could have added a third late on when Redeem Tlang dragged a shot wide after being sent through on goal from a counter-attack. However, it would not matter as NorthEast gained a massive three points while Mumbai ponder their attacking woes, having drawn blanks in three successive games.